We do our best to limit our use of unnecessary packaging and plastics. Whilst the majority of your produce and products will be delivered in recycled boxes, sometimes plastic bags will be used to label your items so that they don't go missing during the day. Right now, our team is busy researching, designing and testing more environmentally friendly forms of packaging. We're also working with our retailers on what we can do together to lower our environmental impact. 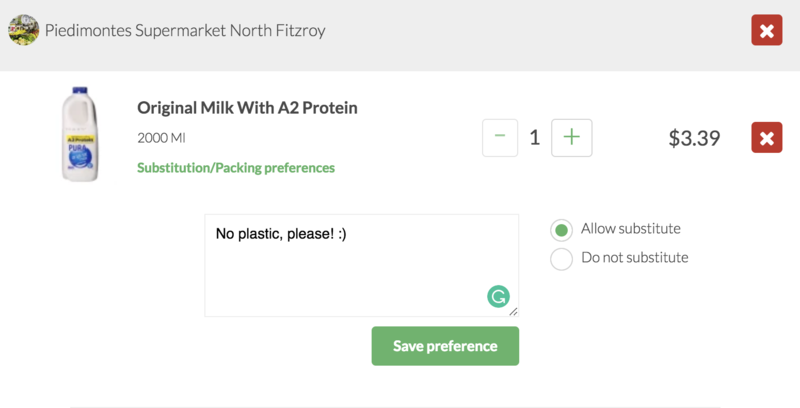 We have a feature that allows you to leave notes against items, whether it be packing preferences, substitutions options or quantity requests. A way that our customers like to control the use of plastic bags in their orders is by adding a packing notes onto one item from each store they order from. For example, "No plastic please." "Please limit the use of Plastic bags." "If possible, paper bags only"
Once you've added the note, please remember to hit Save Preference Otherwise it won't save. This packing note will remain on that item so that when it's ordered again, the note will still be there for our packers to see. We recommend popping these notes on your staple items like milk, bread, apples, etc. Our whole team, as well as the stores we work with, are very passionate about reducing plastic usage. We understand banning the bag is very important to our customers so we're hoping to get rid of plastic bags all together soon. What about the boxes and eskies? Yes you can absolutely return the YourGrocer bags and boxes to us! We love to reuse and recycle them. We'd be more than happy to do a trade during your next delivery. Otherwise, if you don't think you'll be home, feel free to leave them out and let your driver know by adding a delivery instruction to 'please collect bags'. To keep our deliveries cool, our cold bags contain at least one frozen ice pack each. These ice packs are non toxic and completely food safe! When you return them we clean and reuse them.